Made of 100 percent Ultron nylon 6,6 fiber, the Executive Suite's styling gives a modern take to a popular classic style for office space. 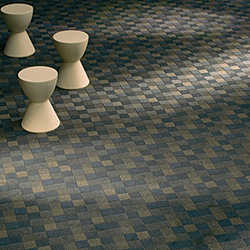 The textured pattern cut-loop construction comes in finished yard weight of 24 ounces per square yard. The primary backing is 100 percent synthetic and the secondary backing is made with 10 percent post-consumer content.